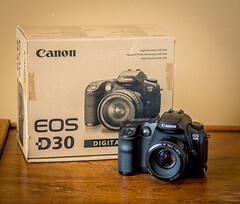 The EOS D30 (not to be confused with the much later 30D) is a 3.1-megapixel digital SLR camera made by Canon, first announced in 2000. 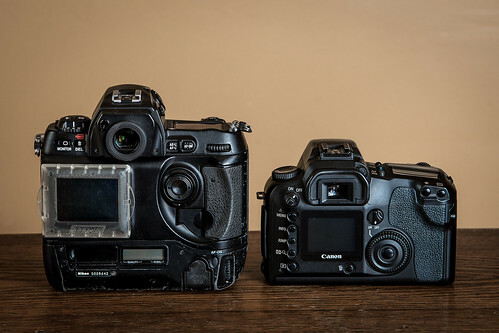 It was vaguely notable for being the first all-Canon digital SLR (some earlier Kodak DCS cameras being based on Canon EOS film bodies), for having a CMOS (rather than CCD) sensor, and for being the lightest and smallest digital SLR of its time. The D30's sensor is a 22.7 x 15.1mm CMOS sensor (not a CCD, common both before and after the D30), giving an FOV crop of about 1.6x. ISO can be set in whole stops from 100 up to 1600 (although a strings dump shows references to 3200 and 6400 as well, which hints that they might be present but disabled). The firmware is based on Datalight's ROM-DOS, running on an x86 processor, as used in the Canon PowerShot Pro70 (among others). One can create up to 3 parameter sets, with sharpness, saturation, and contrast from -1 to +1. However, this can not be set from within the camera. One must use Canon's TWAIN driver to create or edit parameter sets and transfer them to the camera, which will then be accessible via a "Parameters" menu item (where they will be, rather inconveniently, named "Set 1", "Set 2", and "Set 3", with no indication of what lies within). 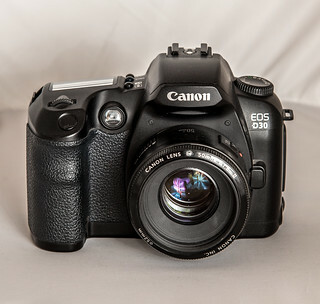 The details of camera-computer communication have been tightly guarded by Canon, though the gphoto team have reverse-engineered the protocol to permit transferring files from the D30 under minority operating systems like Linux and the BSDs. Numerous custom functions are available. Some of the more interesting ones are "sensor cleaning" (which doesn't actually clean the sensor), and a part-time mirror lock-up (which locks up the mirror prior to exposure; when used with the self-timer, it reduces the self-timer delay to a couple of seconds, to facilitate easy and quick use in low light on a tripod). 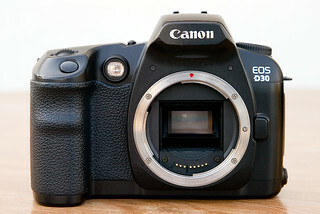 The body's design is very similar to those of Canon's semi-professional film cameras of the time. The body is polycarbonate (plastic) around a stainless steel frame, with build quality characterised as "[s]turdy, but not a professional camera". At the time, it was the lightest (at 780g) and smallest digital SLR body around. The rear of the camera has a 1.8" TFT screen. It has dedicated or semi-dedicated (dual function) buttons for flash exposure compensation, metering mode, drive mode, autofocus mode, white balance, AE lock, and focus point selection. The "Set" button can be programmed to change ISO, image quality or camera parameter sets. The camera is built around the autofocus Canon EF lens mount, and as such, is compatible with all Canon EF lenses. However, it will not mount EF-S lenses. Although the 1.6x cropped sensor is the same size as those in some later 1.6x bodies, the EF-S mount (which was introduced in 2003, around the same time as the 300D) is physically incompatible with EF mount cameras to prevent damage to the larger mirrors of 35mm EOS film cameras. Some more enterprising people work around this by attacking EF-S lenses with hacksaws,, or by replacing the plastic baffles of EF-S lenses with one from an EF lens. The camera has a built-in pop-up flash (guide number 12/39 at ISO 100, which supports E-TTL operation, as well as a PC socket. to be the first true digital concurrent to amateur system SLRs for 35mm film. 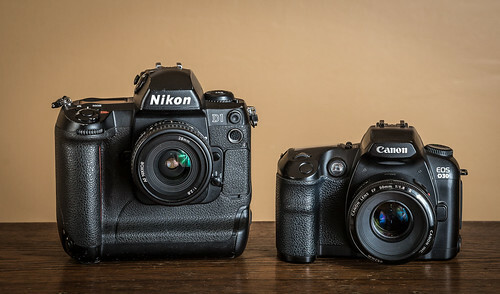 The analog SLRs soon vanished from the market in the following years. The D30's vertical-travel focal plane shutter has a top speed of 1/4000, with flash sync at 1/200. The meter is functional from EV 2 to 20 (at ISO 100, f/1.4), with AF functioning at up to EV 18. The longest automatically-timed exposure is 30 seconds, and there is a Bulb mode for exposures longer than that. One gets +/- 2 stops of exposure compensation (adjustable in either third or half stops), as well as auto exposure bracketing of up to +/- 2 stops. There are numerous exposure modes available, including fully manual. aperture priority, shutter priority, and Program. There is also a fully automatic mode (much the same as Program, except some "advanced" features are disabled and it will pop up the flash without asking you if it sees fit -- making the D30 into an oversized, overweight point-and-shoot), plus a few "scene modes". The camera can run at up to 3 frames per second for up to 8 shots (with Large/Fine JPEGs; a smaller JPEG quality setting will fill the buffer less slowly, and RAW will fill it up much quicker). Along with the full range of Canon EF lenses, the D30 is compatible with a wide range of equipment from the Canon EOS family, including E-TTL and FP flash operation with EX-series Speedlites. The BG-ED3 battery grip, designed specially for the D30 (and being re-used in the later D60 and 10D, gives one two batteries, as well as a convenient grip and extra shutter release for vertical operation. The D30 was originally supplied with a 16MB CompactFlash card, holding a mere 10 large/fine JPEGs. Much larger CF and CF Type II cards can be used, though cards larger than 2GB may not work at all (these cards post-dating the D30 by quite a while). Millenium novelty: System DSLR as consumer product. ↑ Various sites give differing figures, anywhere up to 3.3 megapixels. Canon themselves - giving a figure of 3.25; the sensor actually has 2226 x 1460 pixels, but only 2160x1440 (3,110,400 pixel) "effective" (i.e. the number of pixels in the final image). Here, we take the effective figure. ↑ 2.0 2.1 According to a review on Steve's Digicams. ↑ See gphoto's list of supported cameras. ↑ Quoted from photonotes.org (archived). ↑ 5.0 5.1 5.2 According to Canon's specifications. ↑ See Bob Atkins' Modifying the Canon EF-S 18-55/3.5-5.6 lens for use on a Canon EOS 10D. ↑ See Canon 17–85 mm IS USM lens: EF-S to EF mount conversion (archived) by Rich Cutler. Bill Biggart's Final Exposures. Bill Biggart was a photographer who was killed in the September 11 terrorist attacks; his D30 was recovered from the rubble of the World Trade Center.